Today’s equipment and gadget list includes a knife of incredible sharpness, and two healthy eating gadgets that are a pleasure to use – and to clean, the Spiralizer, and a cold press juicer. 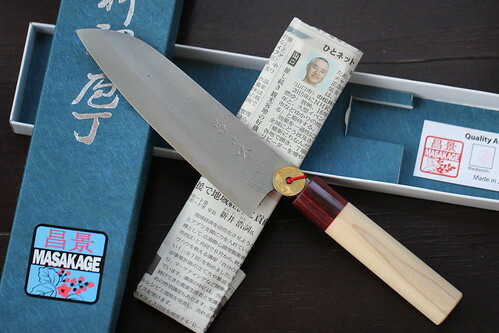 Don’t be misled by the low fi packaging: all Masakage knives are individually crafted, (no two are the same) at a small forge manned by veteran blacksmiths, and mottled with marks and flecks from the handmade manufacturing process. 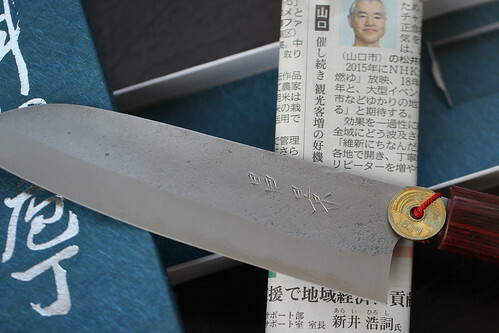 Each Masakage knife comes wrapped in a Japanese newspaper from the day it was forged, and is made from white carbon steel, sandwiched between softer stain resistant steel, which protects the core from possible rusting so users get the best of both worlds, easy maintenance and a super silky edged blade. The handle is white magnolia and the cap end red pakka wood. Most importantly of all, this is an incredibly sharp knife, which glides through everything like the cliched knife through butter. It’s not a knife for a rank amateur, but if you want to up your game in the kitchen, then this may well be the knife for you. Oh, and it’s pronounced Mah-sah-kah-ge. And, if you worry about removing a finger, then may I recommend The Divertimenti Cookery School Knife Skills Class? I wrote this Knife Skills Story about my experience there earlier this year, when I bought Emily and I a day course (call it staff training). 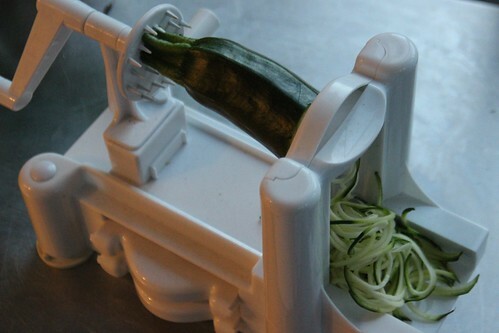 ooh a Spiralizer. All over the internets, Pinterest and every healthy and raw eating book out there, the Spiralz Spiralite Spiralizer creates ribbons from firm fruits and vegetables (think courgette, cucumber, carrot, sweet potato, celeriac, kohlrabi, radishes, apples, fennel) by using the 3 different interchangeable blades. There’s one blade for thin spaghetti, one for ribbons like pappardelle, and the other for thicker noodle strands or curly fries. It’s purely mechanical: you just anchor the vegetable in the plastic grips, and wind the handle. It’s that simple. I mainly use it for the courgette/zucchini noodles, known by Spiralizer aficionados as courgetti, which are delicious raw in salads, heated but not cooked by immersion in boiling water, and fantastic flash cooked in stir fries. It’s also easy to rinse and clean. Mine was £29.99 from Amazon. 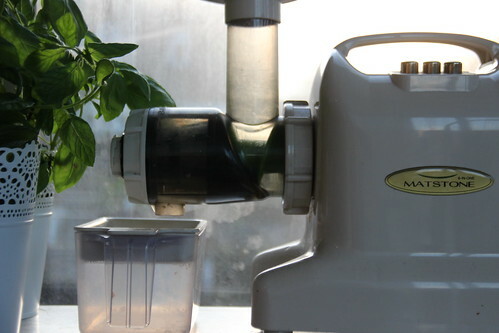 I um-ed and ah-ed for a long time about buying this Matstone cold press juicer It’s not cheap – around £179, and that’s a big investment for what is, essentially, one daily juice, if you live on your own. But it beats conventional juicers hands down, as it can juice all manner of leaves and fibrous vegetables, which they cannot. It is a real workhorse of a machine because it doesn’t just juice, it can grind nuts and seeds, make purees and sauces, and nut butters, but I have to admit that I haven’t yet tried any of the other functions, mainly because I’m only cooking for one most days, I don’t eat peanut butter, and I don’t like to write recipes with equipment to which most people don’t have access. But I don’t regret buying it, even if I only juice once or twice a week now that the novelty has worn off. It has easily paid for itself – when you consider that London powerjuices are a fiver a pop, and it is a doddle to clean, unlike most juicers on the market. If you want to know more about the benefits of cold pressing juicing, I blogged about it, and made a short video about it too here. And, of course, I must mention, again, my cookbook Friends, Food, Family: Recipes and Secrets from LibertyLondonGirl, which is also now available on Kindle. It makes a wonderful Christmas present! Shopping: Updated Cyber Monday Online Offers for LLG readers! Spiralisers also absolutely fabulous, I used mine daily in summer when we basically ate barbequed meat of some description with massive bowls of salad every day for months! They, along with a mandolin, take salads to a new, spectacular level! Those are amazing gift ideas for the holidays! I’ve been into drinking juice lately as well, it’s a convenient way to stay healthy during the holidays. Thanks so much for sharing!